A common Fix for a sagging gate is a cable and turnbuckle. My Friends new garage doors are sagging just like a wide gate so I am helping him fix that problem by making some brackets to attach a cable and turnbuckle setup. So the plan is to tig weld the brackets on the bench and then to take my lincoln 210mp on site to weld the brackets to the door frames. I used a piece of cardboard to make a template for the odd angle and radius on the top bracket and cut pieces out of 3/16" cold rolled steel. The bottom brackets were just a simple 90 degree angle so cutting them on a dry cut saw worked just fine. I decided to tig weld all the brackets in my shop. I used 160 amps and er70s-6 filler rod...a #8 cup with 15 cfh argon. Backing up the welds with a block of aluminum helped a lot. 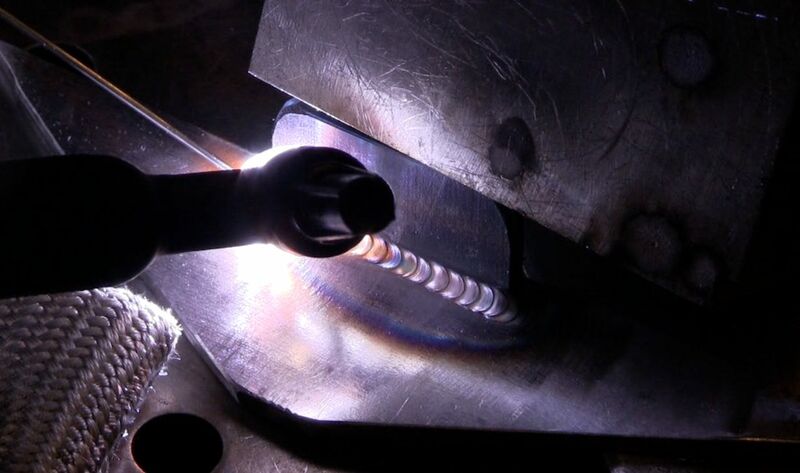 When you need to place a fillet weld on both sides of a piece of metal what often happens is the first side welds just fine....but the second side does not because its heavily scaled and oxidized. The aluminum block helps ...it prevents oxidation just enough so that the second side welds just as nice as the first. 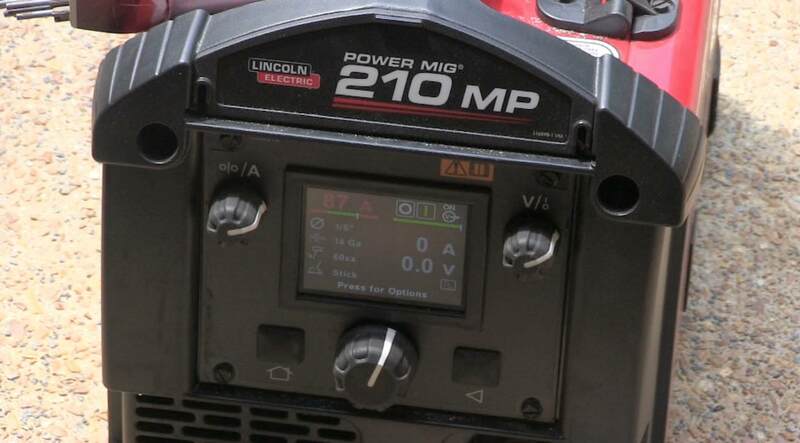 I chose the lincoln 210 mp along with 6011 1/8" (3.2mm) rods to take to my friends house because it is a dual voltage machine that can run off an extension cord ...and its a good little stick welder. 6011 is very much like 6010 but is designed to be used on any polarity as well as AC....and inverter power sources like the lincoln 210mp usually will burn a 6011 but wont burn 6010 very well. when you are welding outside, you never know how when a breeze is coming..stick welding works in breezy weather and mig does not. Once the brackets were welded, cables and turnbuckles were installed. 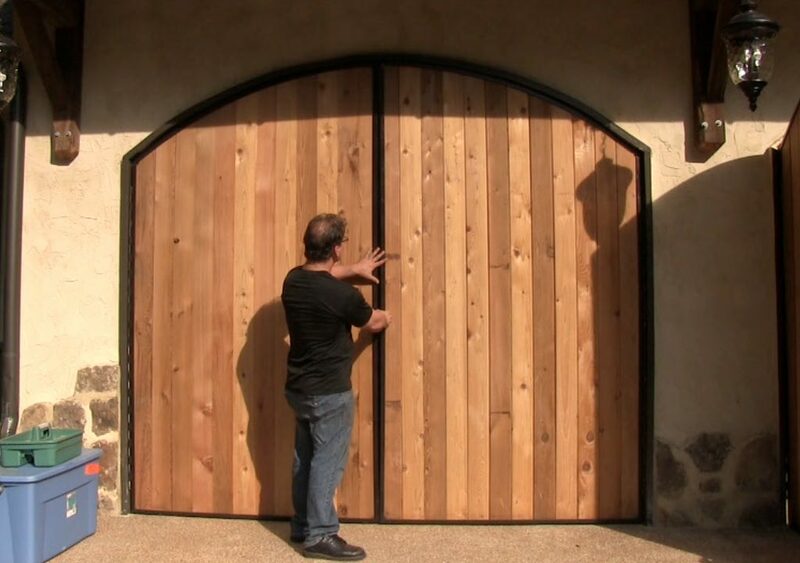 Before this modification, these doors were sagging so much that the bottom of the frame scraped on the driveway and they would not even close without manually lifting them. Now that the brackets and turnbuckles are in place, the doors swing freely and are now completely adjustable should they every sag again. All that is left to do is weld a piece of flat bar where the 2 doors meet and then install the garage door openers.